Along with spring, The Mission Community Market is returning to Bartlett Street on April 14 after a four-month winter break. For the second year in a row, the vibrant community market will brighten the otherwise bleak alleys in the heart of the Mission District. Ultimately the organizer’s goal is to make the blocks between 21st and 22nd Streets a beautiful park-like space for people in the neighborhood to enjoy every day. One way they are accomplishing this goal is by creating a series of murals on the block. Last summer, Sirron Norris, CUBA and youth from the community created the first mural on the side of Revolution Cafe. 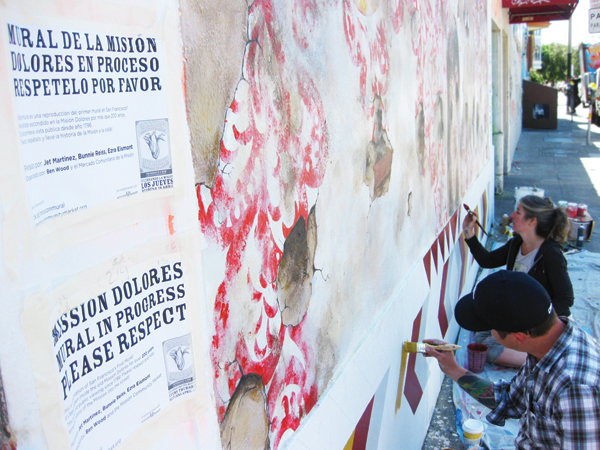 Right now, they are striving to recreate one of the earliest murals ever made which is unavailable for public viewing because it is built inside of Mission Dolores. The mural was painted by Ohlone artists in 1791 under the supervision of Spanish missionaries. Ben Wood and Eric Blind rediscovered the mural in 2004 and have digitally documented it. The project will recreate the 18th century mural as a significant piece of Native American and California history blocks away from the original in Mission Dolores. “There will be more of everything this year,” organizer Jeremy Shaw said about the re-opening of the market. We can look forward to people casually shopping for colorful organic produce and unique handmade crafts while middle-school kids perform hip-hop and bluegrass folk singers provide a soulful soundtrack. Instead of parked cars, the street will be crowded with stalls of farmers and local vendors. Little children dance, neighbors chat and there are dozens of babies in strollers watching the pleasant commotion in awe. The Mission Community Market, or Mercardo Comunitario de la Mission, brings together a variety of Latino vendors in this neighborhood, from people who began farming in the 60s to new entrepreneurs who are marketing their food and other products for the first time. The outdoor market takes place each Thursday from 4 to 8 p.m. on Bartlett Street between 21st and 22nd Streets. Yerena, 58, and his wife were almost sold out of their signature strawberries last December. They operated out of a large stall lit up with portable lights. A huge white sign featured a larger than life-size photograph of Poli and his family standing in front of the the Yerena Farm, including his son and daughter who are in their early 20’s and his young grandson, Gryson, 3. In the picture his daughter is wearing a San Francisco State sweatshirt. Yerena frequently mentions that his son recently graduated from Fresno State in agriculture and natural resources. He pulled out a piece of cardboard that listed the medicinal benefits of the Yacon, which looks like a sweet potato. Surprisingly, he said it tasted like a cross between a melon and an apple. 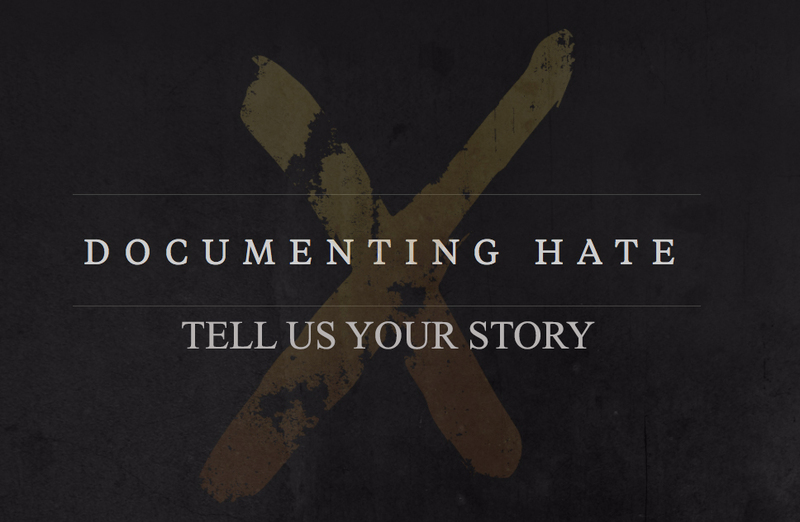 Yerena came to California from Mexico in 1968 when he was 18 years old. His first job was picking strawberries. He was around when Cesar Chavez was working to unionize farm workers and ultimately his family became sharecroppers. They now have 18 acres in Watsonville. “It was hard for me to go organic,” he said. “After so many years of conventional farming using pesticides, it was hard to switch.” But now he embraces the organic process, which he says is much better for the land and helps them to improve their quality. Chrystos Cusigch, 31, is also from Mexico but she’s only had her business selling organic handmade baby clothes, Yatere Organic, for one month. MEDA helps low- and moderate-income Latino families through job creation. “We help people with basic things like improving their credit, reducing their debt, increasing their savings, buying a home and starting a business,” MEDA’s Executive Director Luis Granados said according to SF Gate. Cusigch is one of a half-dozen Latino-owned small businesses to open in the month-old El Mercado, an incubator marketplace launched by the MEDA. She has a shop space there at Plaza Adelante‚ the ground-floor of MEDA’s 19th and Mission Streets office building, which celebrated its grand opening on last October. Cusigch sells beautiful handmade crocheted baby coats and matching rimmed hats in exotic colors like olive green, eggplant and turquoise. They are adorned with beautiful butterfly and sunflower buttons. She also sells handmade “bib-burpees” that sell for $15. “They would be about $50 at a department store,” she said. “My friends make them,” she said. The name of the company comes from the word for moon that indigenous people in Brazil use.